Today I want to write about one of the most epic tales (non-fiction) I’ve ever read: The Book of Mormon. 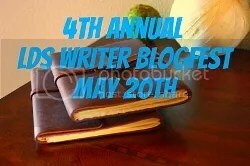 I am participating in the 4th annual Mormon Blogfest, where Mormon writers blog about their beliefs. If you are not a Mormon, you might ask, what makes the Book of Mormon an epic tale? Well, it is a volume of Holy scripture comparable to the Bible. It was written by ancient prophets, and contains the fullness of the gospel of Jesus Christ for everyone living on the earth in the last days before our Savior returns to the Earth. These prophets lived in the Americas 500 years before Christ, during His mortal life on earth, and about 400 years after his death. They wrote about their spiritual experiences as well as the history of their people. The reason I love this Holy scripture so much is whenever I have a question or problem in my life, the answer is ALWAYS in the Book of Mormon. I am so, so, grateful to be a Mormon and have this Holy scripture to guide me and my family through these troubled days. Here is the link to Kayeleen’s blog to read why being a Mormon is important to her.